Description: Red on green knot on tan background with yellow border. A Webelos scout earns the Arrow of Light award by completing requirements from the Webelos handbook. The Arrow of Light award is the hightest Cub Scout award available. 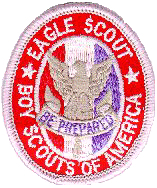 The award patch is worn as a Webelos scout and as a Boy Scout - adults wear the square knot symbol. Description: Red/white/blue on red/white/blue knot on tan background with tan border. Description: Silver knot on dark green and white background with silver border. Award Requirements: The award will take at least 12 months to earn and all work must be completed before the Venturer's 21st birthday. Description: Dark blue knot on white background with white border. Description: Gold on Blue knot on tan background with tan border. Submit a recommendation with this Nomination Form. Description: Red on red knot on tan background with tan border. Description: Green/blue/white on green/blue/white knot on tan background with tan border. Download application and nomination forms from BSA Hornaday Forms page. Description: silver on silver knot on purple background with purple border. Description: Gold on green knot on tan background with red border. 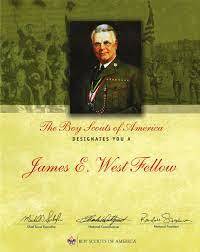 James E. West served as the first Chief Scout Executive of the Boy Scouts of America for over 30 years. The West Fellowship award is available for gifts of $1,000 or more to a council endowment fund. The gift must be in addition to -and not replace or diminish - the donor's annual Friends of Scouting support. The James E. West Fellowship Award is an 8-by-10-inch certificate, personalized with the donor's name, date of gift, and council name. In addition, there will be a distinctive lapel pin/charm and an embroidered square knot for uniform wear. While it is a national recognition, the James E. West Fellowship award is authorized and presented by the local council. Description: purple on purple knot on silver background with silver border. Description: gold on gold knot on purple background with gold border. Description: silver overhand knot on deep blue background with silver border. Description: blue on blue knot on red and white background with red and white border. The central labor council invites all local unions to submit their candidates for the award. 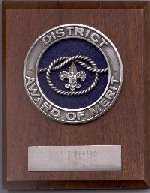 Any person, group, affiliated council, or local union may nominate a Scouter/member for the George Meany Award. The nominee must have the local union's recommendation as well as BSA council certification. The central labor council forwards the recipient's completed application to the Labor Relationships of the Boy Scouts. Description: gold on gold knot on red background with gold border. Any registered commissioner who is providing direct unit service is eligible to earn the Commissioner Award of Excellence in Unit Service, through unit service and a project that results in improved retention of members and on-time unit recharter, over the course of two consecutive years. If a commissioner who is not registered as a unit commissioner wishes to earn this award, they must work with the district commissioner where the unit(s) is/are registered. Be a participant or staff member in ONE continuing education event for commissioner service.1 For example: district, council, area, regional, or national College of Commissioner Science, commissioner conference, Philmont, Sea Base, or Summit training. Make at least six significant contacts (in addition to those made in item 2) for each unit served, by telephone, twoway electronic communication, or in person, and log in UVTS 2.0. Provide rechartering service by holding membership inventories, training verification, and Journey to Excellence progress review meetings. Perform charter presentations for the chartered organizations of the units you serve. Performance: Identify a specific goal in a specific unit that would result in higher quality unit performance. Create a written plan to achieve the goal. Track unit self-assessements and retention for two years. Description: white on orange knot on tan background with tan border. Description: white on black knot on tan background with red border. This award recognizes outstanding services by an adult individual or an organization for demonstrated involvement in the development and implementation of Scouting opportunities for youth from rural or low-income urban backgrouds - this is in fulfillment of Dr. Young's dream of justice and equality for all. The award is presented to people at all levels of the BSA. Recipients are approved nationally through nomination by local councils. Description: silver knot on gold/green/red background with tan border. The William D. Boyce New-Unit Organizer Award is presented to recognize volunteers who organize one or more traditional Scouting units. The award may be worn on the adult uniform. The award is a square knot placed over the three colors representing the three phases of the BSA program - Cub Scouting, Boy Scouting, and Venturing. A volunteer can earn the knot by organizing one traditional unit, and a program device can be earned for up to three additional units organized. The award recognizes volunteers for organizing traditional units after March 1, 2005. The award is administered by the Relationships Division and will be presented by the local council. The volunteer organizes the unit by following all procedures as published in the 'New Unit Organization Process' (No. 34196), particularly ensuring that new unit leadership is trained, a program for the new unit is organized and in operation, the new unit committee is functioning, a unit commissioner is assigned, all paperwork for the new unit is completed and processed, and the unit charter is presented to the chartered organization. To further recognize the volunteer's effort for organizing additional new units, a program device can be earned and worn on the new-unit organizer knot. The program device represents the type of unit organized (a Cub Scout pack, Boy Scout troop, Varsity team, or Venturing crew.) The knot and up to three program devices may be worn in recognition for organizing up to four new traditional units. Multiple program devices for organizing units in the same program may be earned and worn. Download a Application Form and New Unit info. Description: yellow on blue knot on red background with red border. The purpose of the ¡Scouting...Vale la Pena! Service Award is to recognize outstanding services by an adult individual or an organization for demonstrated involvement in the development and implementation of Scouting opportunities for Hispanic American/Latino youth. 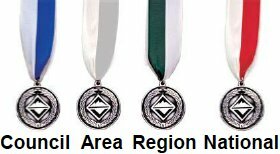 The council's annual quota of awards shall not exceed the number of districts in the council. Emphasis is on being selective, with no intention that the full quota must be used every year. The quota is noncumulative. The council president designates a committee to administer the award for the council. This may be a special ¡Scouting...Vale la Pena! Award committee or the council's advancement and recognition committee, Silver Beaver committee, or council Scoutreach committee. The committee should include at least one person who is familiar with serving Hispanic American/Latino families. The Scout executive or a designated staff member serves as adviser to the committee. Download a Application and Info Form. Description: white on black knot on blue background with blue border. The purpose of the Asian American Spirit of Scouting Service Award is to recognize outstanding services by an adult individual or an organization for demonstrated involvement in the development and implementation of Scouting opportunities for Asian American youth. The council president designates a committee to administer the award for the council. This may be a special Asian American Spirit of Scouting Award committee or the council's advancement and recognition committee, Silver Beaver committee, or council Scoutreach committee. The committee should include at least one person who is familiar with the Asian American community. The Scout executive or a designated staff member serves as adviser to the committee. Description: white on purple knot on tan background with purple border. 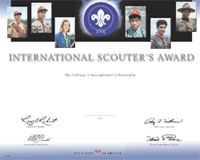 The International Scouter's Award encourages Scouters to broaden their involvement in Scouting through participation in world Scouting activities and recognizes Scouters for their contributions to world Scouting. Serve as an adult leader for a group of BSA Scoutsparticipating in an event held by a foreign Scout association recognized by the World Organization of the Scout Movement. The activity may be an exchange program, camp experience, tour activity, or home hospitality function. Description: Blue globe with three stars on red and white striped background with dark green border. Worn with two stars to wearer's right. Colors correspond to red and white striped ribbon on medal. 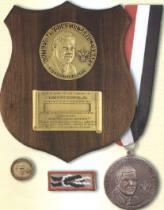 The award is a distinguished service award similar to the Silver Buffalo, Silver Antelope, and Silver Beaver. The award design will be a circular blue enamel silver medallion upon which will be superimposed meridian lines and stars signifying the global scope of the award. An applied silver universal badge of the Boy Scouts of America will be centered upon the front of the medallion. The award will be suspended upon a red and white ribbon and will be worn about the neck of the recipient, when such practice does not conflict with approved uniforming policy. Award Requirements: The Venturing Leadership Award is presented by councils, regions, or National Council to venturers having made exceptional contributions to Venturing and who exemplify the Venturing code and oath. Venturing Leadership Award candidates must be registered and involved as a Venturer for at least one year. Candidate must be a youth member when nominated for the award. Candidate must hold a leadership position or office on the unit, district, council, area, region or national level (as appropriate for the level of award presented). Candidate must show exceptional dedication and give outstanding leadership and service to Venturing and to Venturers on the level appropriate for the award. Download nomination form from BSA page. Description: Gold knot on black background with black border. Award Requirements: This award has been discontinued - see this page. The BSA Speaker Bank program is intended to spread the Scouting message through speakers at clubs and organizations. Every registered speaker will receive an official speaker pin and certificate. After giving 10 speeches, the speaker receives a patch. The award knot is given to speakers after delivering 20 speeches. Description: Red/white/blue on red/white/blue knot on tan background with silver border. Award Requirements: The National Eagle Scout Association has made this knot available to Life Members. Show your NESA Life Membership card at a local Scout Shop and purchase the knot. Either the Eagle Scout knot or the NESA Life knot are worn, not both. Award Requirements: The Doctorate of Commissioner Science Award Knot is available to any currently active commissioner at any position by completing Application Form which details the requirements. Description: gold on gold knot on blue field with blue border. Description: gold on gold knot on blue field with gold border. Be a currently registered Cubmaster, Scoutmaster, Coach, or Advisor who has served in that position at least 18 continuous months. Use this Unit Leader Award of Merit nomination form. Keep track of your progress in earning the Cubmaster Key Award with this progress record document.